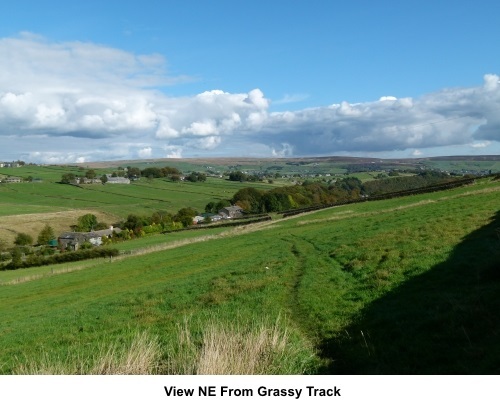 Introduction: This walk from Hebden Bridge is a gentle stroll through some of the industrial archaeology in the countryside around this former textile town. 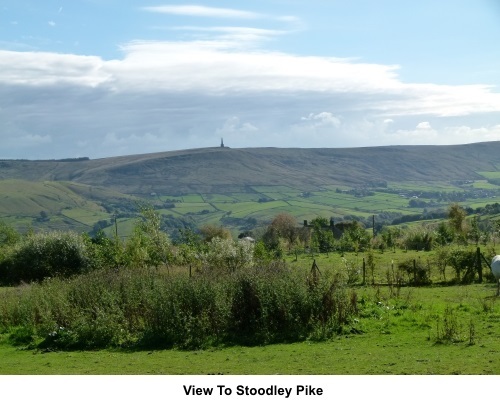 The route also rises to over 1000ft and so provides some lovely views too, not least across the Calder Valley to Stoodley Pike. The walk passes along part of the Rochdale Canal, which was opened through Hebden Bridge by 1799 and to Manchester some 5 years later. Following a period of dereliction, it was reopened in 2002. 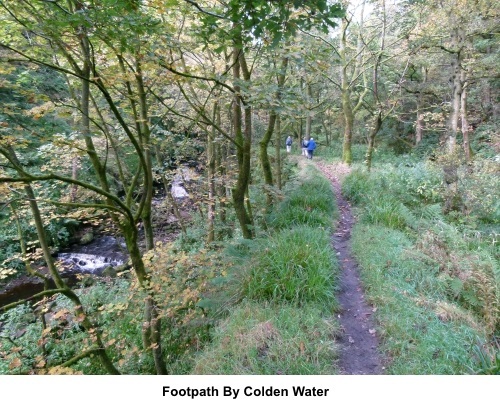 The route then climbs the “clough” (a steep sided valley) of Colden Water where various remains of mills are evident, not least two huge chimneys at the sites of the former cotton spinning mills of Lower and Higher Lumb Mills. 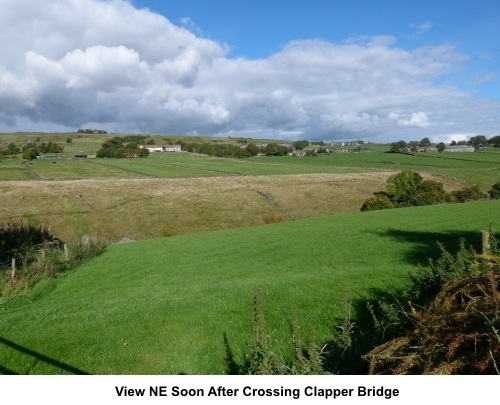 After crossing an ancient clapper bridge, the walk climbs a little to Jack Bridge, where there is a treat in store for lovers of good beer and pub food in the shape of the gloriously named New Delight Inn. This was saved from oblivion by the current owners, a family business, which brews the Bridestones beer on offer. Their Bridestones Gold is a joy! 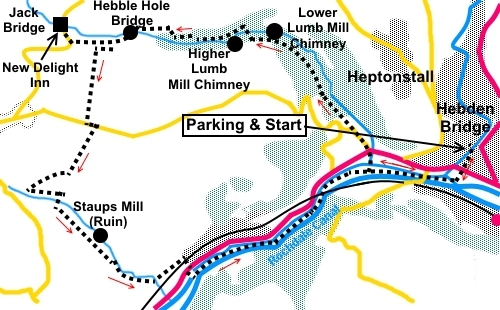 Finally, the walk returns to Hebden Bridge via Jumble Hole Clough, where more mill remains feature, not least Staups Mill. A last wander along the Rochdale Canal once more completed the journey. Quite a lot of this walk passes through deciduous woodland, so should provide a colourful walk when the trees have their autumn colours. On the downside, GPS signals may be unreliable under the trees but the paths are obvious. The walk starts at the pay and display St Georges Street car park in Hebden Bridge. Note this is the market square on Wednesdays and is then unavailable. There are public toilets here. 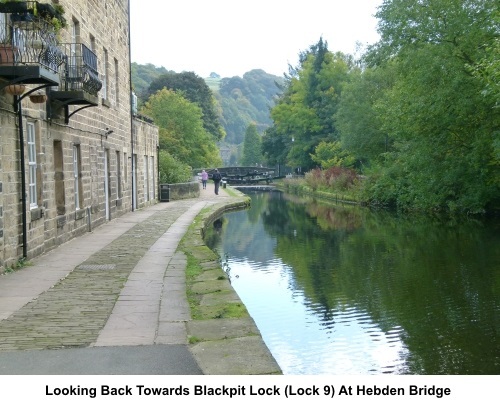 Start: Exit the St Georges Street car park and turn left along St Georges Street to cross the beck (Hebden Water). At the corner, turn right along the pedestrianised area (Bridge Gate). At the A646, cross it via the traffic light controlled crossing, which leads you nicely to Holme Street. Follow this to the Rochdale Canal and turn right to follow the towpath, passing Blackpit Lock (Lock 9). Follow the canal for almost half a mile then turn right off the towpath, to follow a public footpath fingerpost (SD 985272). Follow the path to the main road (A646). Cross and walk up Church Lane. Pass St. James the Great parish church and at the cross roads keep straight ahead, walking uphill. Follow the road (Bank Terrace) until it turns sharp left. Here, branch off right, to follow the public bridleway fingerpost for “Jack Bridge”. The road here is named as Colden Road. 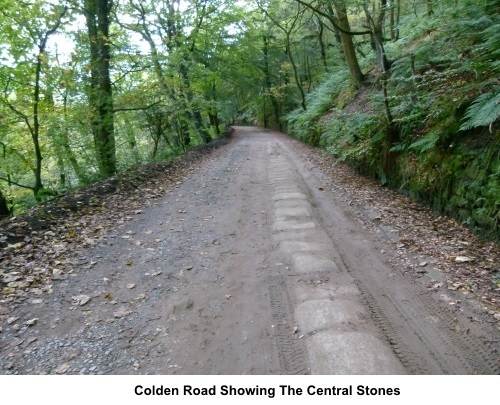 Colden Road soon becomes a rougher broad track and you will note a row of stones up the centre, presumably to reduce erosion in the days of packhorses. When the track splits, take the right fork. 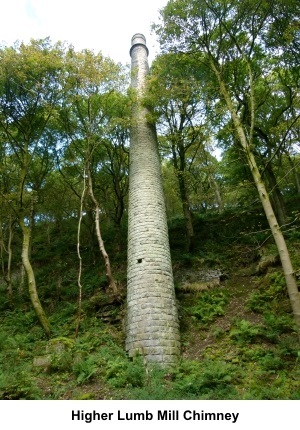 You pass a large chimney at what was Lower Lumb Mill (SD 977282). The track drops to a bridge but ignore this and continue up the left hand bank of the stream. 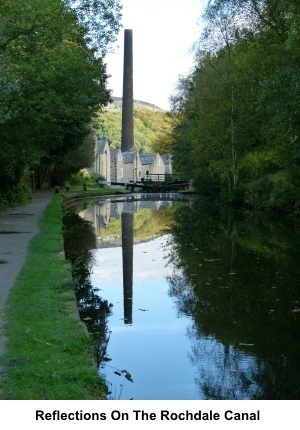 You pass a second chimney, which was Higher Lumb Mill (SD 975281). 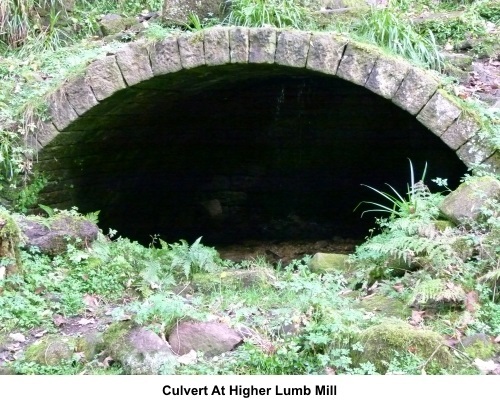 Follow the track until you get to a large arch, which marks the end of a culvert built to divert the beck (Colden Water). Climb the steps at its right hand side. Follow the climbing, narrow path, until you reach an old dam. Turn left to cross this, then follow the right hand bank of Colden Water. Continue to follow the path as it turns right, away from the beck. After a shot climb, you come to a footpath marker post with yellow footpath arrows. Go left here. Go left too, when you reach the next marker post. At yet another marker post go right. The path leads up to an old stone wall. Turn left to follow it. You arrive at a post bearing a notice which tells you have reached the end of the Hebden Bridge Loop. 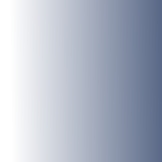 This has no particular relevance to this walk but will confirm you are on the right path. Continue straight ahead, ignoring the right turn. 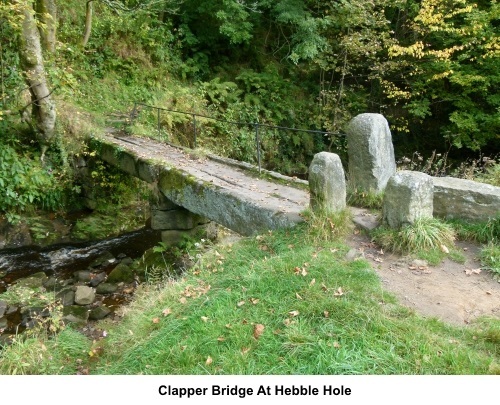 The path leads down to a clapper bridge at Hebble Hole (SD 967282). The Pennine Way crosses this, as should you. At the far side, climb the rough steps to join a broad track. Turn right. After only a couple of hundred yards, note a footpath going off to the left, marked with a yellow arrow. This is your onward route but if you intend to visit the New Delight pub, continue along the track for three or four hundred yards to join a road (SD 963281). Turn right and the pub is soon visible on the left. Returning to the onward route mentioned above, turn right here (or left if you do not visit the pub). The path climbs briefly to another broad track. Turn right here and at the ‘T’ junction of tracks, turn left (SD 965281). 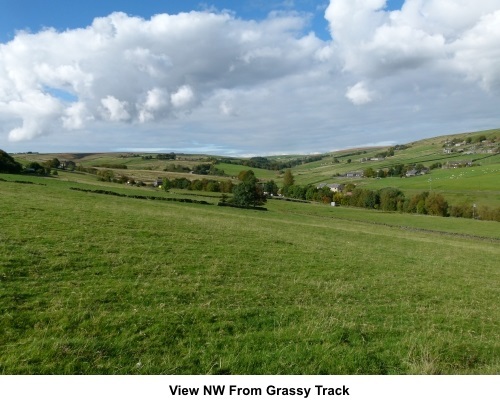 This is a walled track and there are good views along here of the surrounding countryside, including south to Stoodley Pike. Follow the track to the road and turn left. Walk along it for a mere fifty yards or so before turning right on to Marsh Lane. There is also a Pennine Way fingerpost. A few yards along Marsh Lane, turn right along a track to White Windows Barn. As the track turns sharp right to the farm buildings, keep straight ahead over a rough stile to join a walled grassy track (SD 964274). This was easy to miss when I did the walk, not least because of the forest of nettles! The track runs for two hundred and fifty yards or so before ending at a gate and stile. Cross the stile and turn right. Follow the right hand boundary of the field, initially by a stone wall then left alongside a fence. In the far corner of the field, go through a kissing gate and straight across the next field to a stone stile (SD 960270). Cross it and bear left to follow the fingerpost for Jumble Hole Clough. This fingerpost had obviously seen better days at the time of my visit and the wording was hard to make out. The path leads down to a footbridge. Cross it and turn left to follow the right hand side of Jumble Hole Beck. 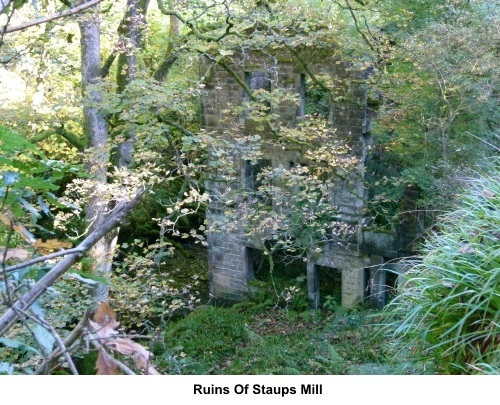 Soon, you pass the ruin of Staups Mill below you on the left. At a wooden stile on the left, cross it, following a yellow footpath arrow. The path joins a wide concrete track on a bend (SD 965266). Proceed ahead to follow the concrete track downhill, crossing a bridge and round a couple of sharp ‘S’ bends. Remain on this track until you reach a railway bridge. Just before it, turn left along an “unadopted” residential street (Underbank Avenue). At a ‘T’ junction, turn right to join the main A646. Turn right briefly for a hundred yards or so before going over a bridge across the River Calder to the canal. Turn left to follow the canal towpath back to Hebden Bridge.